Highlight the text using the cursor. Hold down the Ctrl key (short for "Control"). Press the C key (C for "copy," naturally). Let both keys go. Your text is now copied. Click the cursor wherever you would like to paste the text. Hold down Ctrl. Press V. V stands for "voila, you've just copy-pasted some text." Say it with me now: "Control Alt Delete." This is now your mantra for whenever a program freezes. If you can't get the program to close normally, or if it's generally bugging out, hold down the Ctrl, Alt and Del keys together. 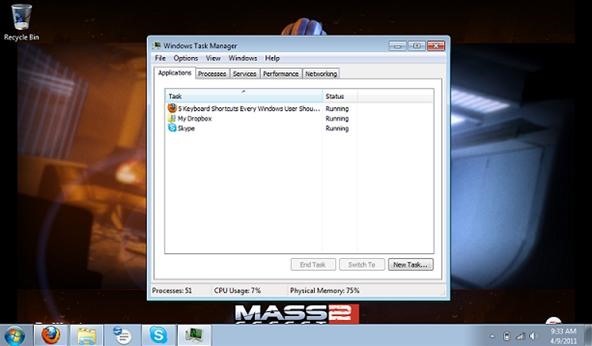 This combo opens up a handy utility called the Windows Task Manager. The only tab you need to worry about for now is "Applications." That shows you all the programs that you have open. As you can see in the screenshot, I've got Firefox, Skype and Dropbox running. The "Status" column tells me that everything's working fine. If one of them were to freeze, however, the status would change to "Not Responding." If you find yourself with an unresponsive program, highlight the program listing and click the "End Task" button there at the bottom of the window. Take a deep breath, give it a minute, and that troublesome program will close right up. Look at your keyboard. Do you see a key near the bottom left corner with the Windows logo on it? Go ahead and press it. I bet your Start menu just opened up. This may seem like a somewhat redundant key, as clicking on the Start menu is hardly a difficult task. But if your mouse stops working (it's rare, but it happens), the Windows key can be a lifesaver. Go ahead and try this out. Press the Windows key. Now use the arrow pad on your keyboard. You'll notice that the menu entries are being highlighted as you move around. Pressing Enter will launch any one of them. Now use the arrows to move all the way down to the bottom of the menu. Press the right arrow key to select the shutdown/restart button. See how that might come in handy if you're mouseless? Hold down the Alt key, then hold down the Tab key. A little box will appear in the middle of your screen. The program icons for everything you have open are right there in that box. While holding Alt-Tab, you can use the arrow keys or your mouse to select any one of them. It's a fast way to switch between programs, but it's also got another use. Let's say that you're running a full-screen program that can't be minimized easily (most likely a video game). You need to get into your browser for a minute, but you don't want to quit the program. Just use Alt-Tab. The full-screen program will be minimized and you can use your desktop normally. Just click on the program's icon again to pop it back up. If you need some help ASAP, press the F1 key to open up the Windows Help utility. You can use this tool to search help topics and get troubleshooting advice. This key only works if you're on the desktop. Pressing it while you have other programs open won't do anything (or it may have a separate command within the program you're using). And if you're really digging the idea of keyboard shortcuts, just type "Shortcuts" into the search field at the top of the Help screen. You'll find a list of dozens more.